Poor Alice, is there no middle ground between suffocating banality and nonsense? As far as she can tell, there isn’t. Stuck looking at Wonderland through the lens of reality, influenced by the rules that raised her, Alice sees nothing but madness when she journeys through the unfamiliar realm. If only Alice had lived a half century later, she could have used Lucidchart to transcend her point of view and recognize the alternative logic guiding the world of Wonderland. One belief from her past that restricts Alice’s perception of Wonderland is her concept of identity as a constant, rigid entity. 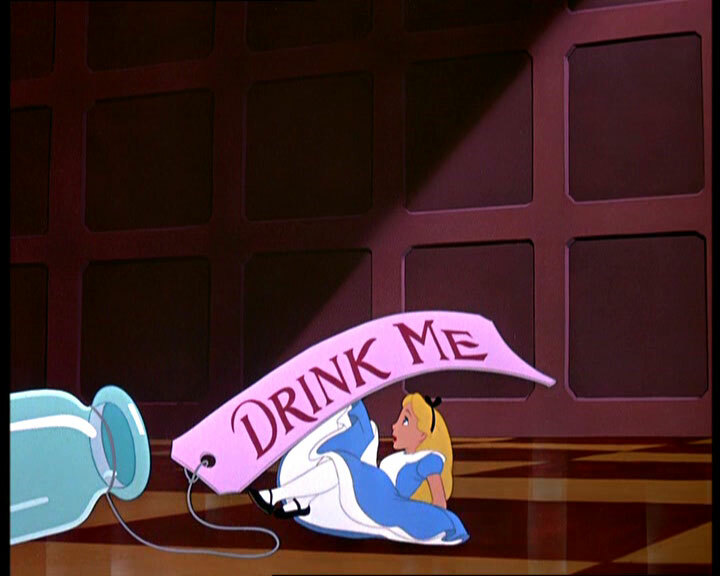 This concept is challenged early on in her adventure, when Alice, who finds herself too large to fit into the door at the bottom of the rabbit hole, drinks from a bottle labeled “drink me” and shrinks until she is just a few inches tall. Unable to look at this encounter from a different point of view, Alice sees the Caterpillar’s questions as pointless and unanswerable. If she had mapped out this conversation using Lucidchart, she would have seen its underlying logic. 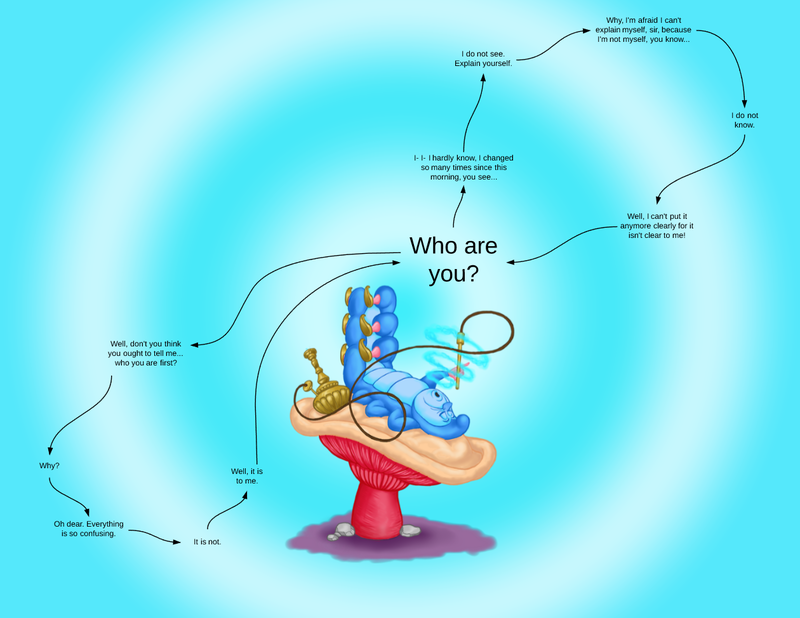 Centered on the question, “Who are you?” the Caterpillar’s logic takes on the shape of a figure eight, mirroring his looping hookah hose and the lazy smoke rings emanating from his relaxed, o’d lips. This logic, which is circular rather than linear, supports the existence of questions that do not have a single right answer but rather have multiple answers that are constantly in flux. According to this logic, Alice’s desire to answer the question “who are you” correctly is silly and futile. Had she been able to visually map out this conversation, Alice would have noticed a circular pattern akin to the Caterpillar’s looping hookah rings, in which multiple paths lead to the same destination and multiple destinations arise from each path. This map would have helped her see that in Wonderland, like the notion of a stable identity, there is an elusiveness to the notion of a single, correct way. The limitations of Alice’s insular perspective bring her to a breaking point when she joins the Mad Hatter, the March Hare, and the Dormouse for tea. Alice, whose reason for seeking out these characters is to track down the White Rabbit, becomes fed up with the seemingly purposeless nature of the tea party and proclaims when she leaves, “Of all the silly nonsense, this is the stupidest tea party I’ve ever been to in all my life.” Had Alice been able to regard the event through the lens of a Lucidchart diagram, she would have recognized the same circular logic that guided her previous encounters in Wonderland. At the center of the diagram is the topic of tea; no matter where it strays, the focus of the celebration inevitably returns to this topic. Just as the Caterpillar is content to exist in a state of perpetual questioning, unconcerned with finding answers, the tea party participants are blissful in their repetitive festivities. However, unable to relinquish her planned path, Alice is blind to this pattern and sees the tea party as a roadblock rather than a celebration. 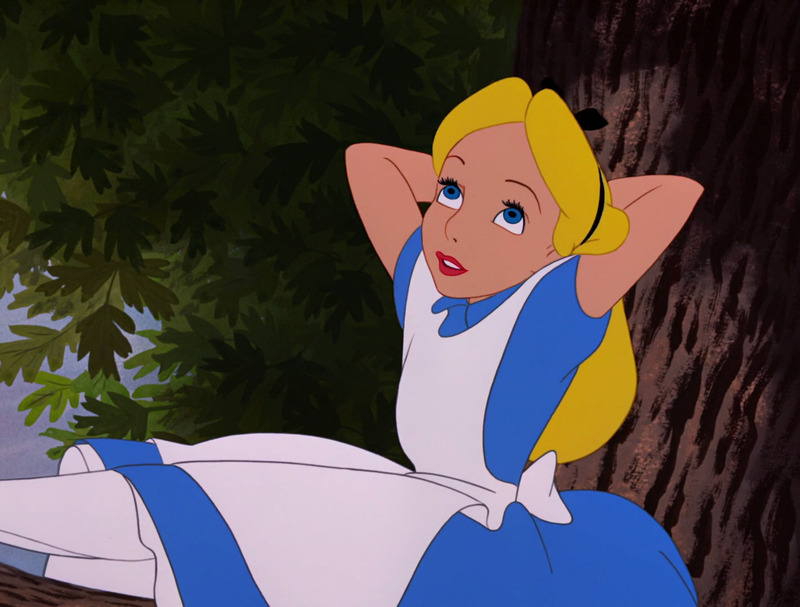 During her journey through Wonderland, the rules and beliefs that Alice brought with her from the real world prevent her from noticing or appreciating the patterns and truths around her. Through her eyes, Wonderland is a place of pure nonsense, a place where she does not belong. 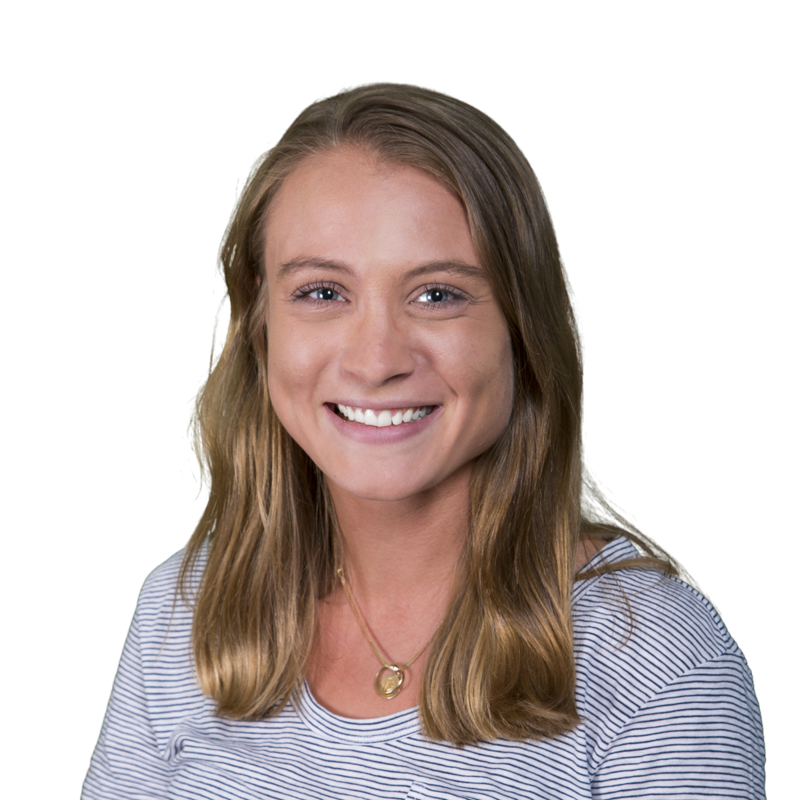 If Alice had seen Wonderland through the lens of Lucidchart, she could have escaped the confines of her perspective, seen the patterns guiding the nonsense, and gained wisdom from her experiences. 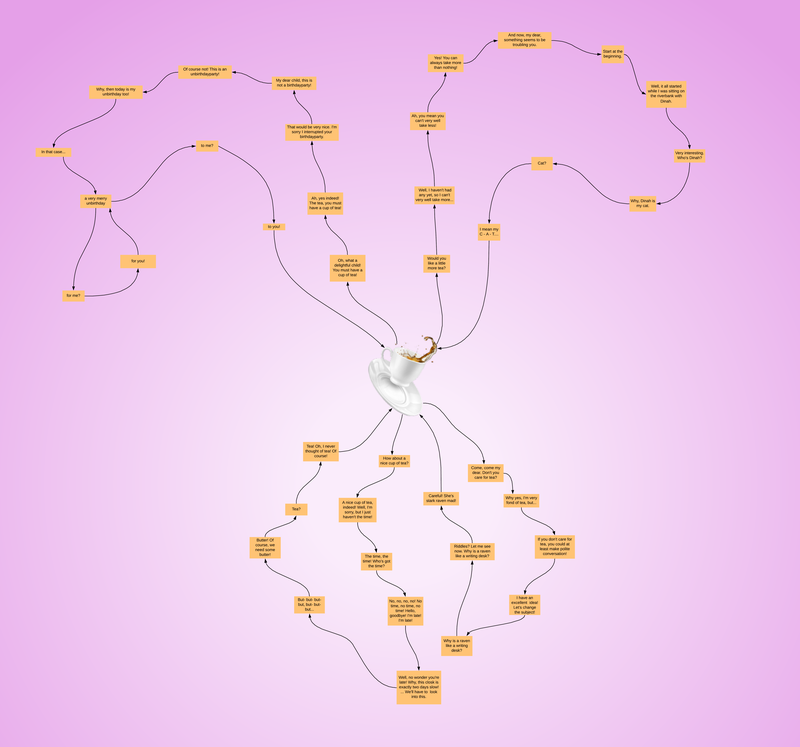 Lucidchart wasn’t there for Alice, but it is here for you. Free your mind from constrained patterns of thought and unlock possibilities previously unknown. 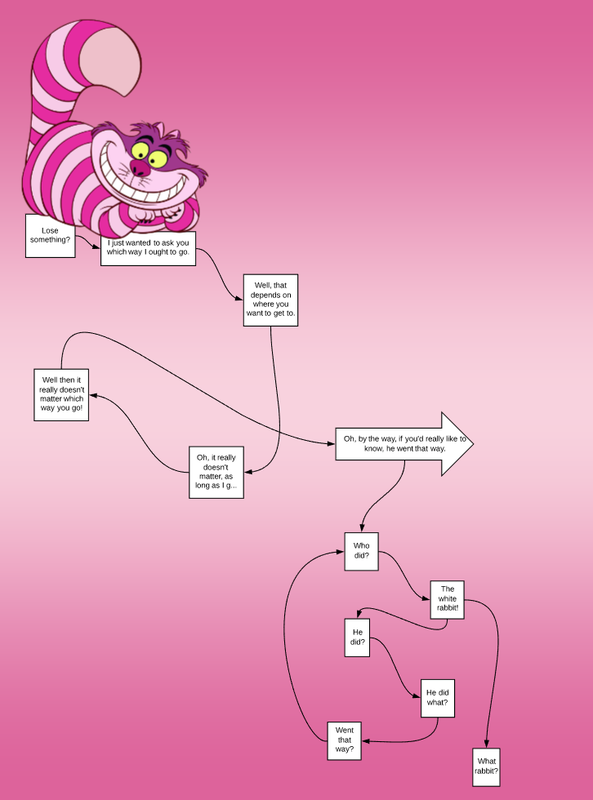 Use Lucidchart, and open your mind to Wonderland.